“I think it was Jean Cocteau who said fashion is what seems right now and wrong later. Art is what seems wrong now and right later. Great art has that slight discomfort to start with.” – Mark Haddon, in “Music for Misfits”. 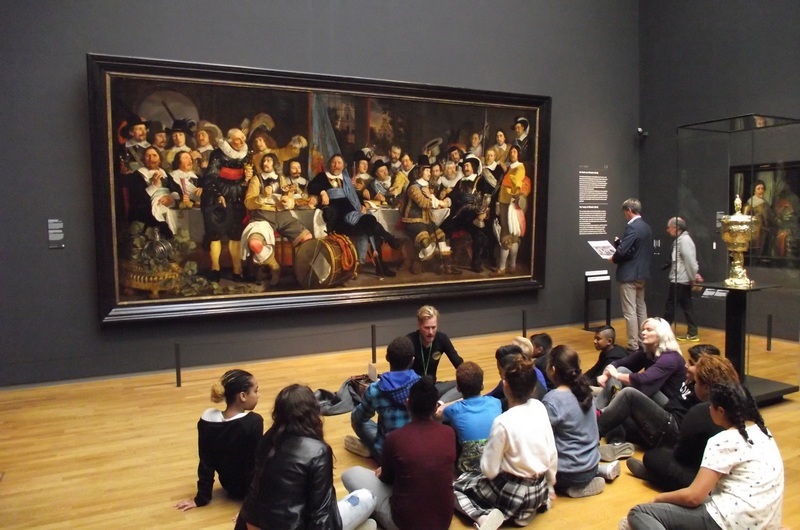 My first impression of Rembrandt’s The Night Watch was gleaned at age ten. It was from my school history book, in a chapter on Dutch colonial rule in the Cape Colony and the doings of the Dutch East India Company.1 There it was, a little black-and-white square at the bottom of a page with funnily dressed characters in it.2 I was to see the actual painting fifteen years later in Amsterdam, and then a few decades later again, this past October, at its new position in the Rijksmuseum. In the intervening time between viewings I had developed a love for art, and came to the painting with a new understanding and appreciation. Why the fuss? What makes The Night Watch a great painting, if not one of the greatest paintings ever? Let’s start by saying that Rembrandt is a true genius, and that the work is a masterpiece of genius. The term ‘genius’ is today overused and too readily applied to the latest prodigy. That doesn’t cut it. ‘Genius’ has to stand the test of time and cover a depth of dimensions. A genius is someone who revolutionises a field, nothing less. There is the world’s view of a field before the genius, and our forever-changed understanding of it after his or her contribution. That is the test. 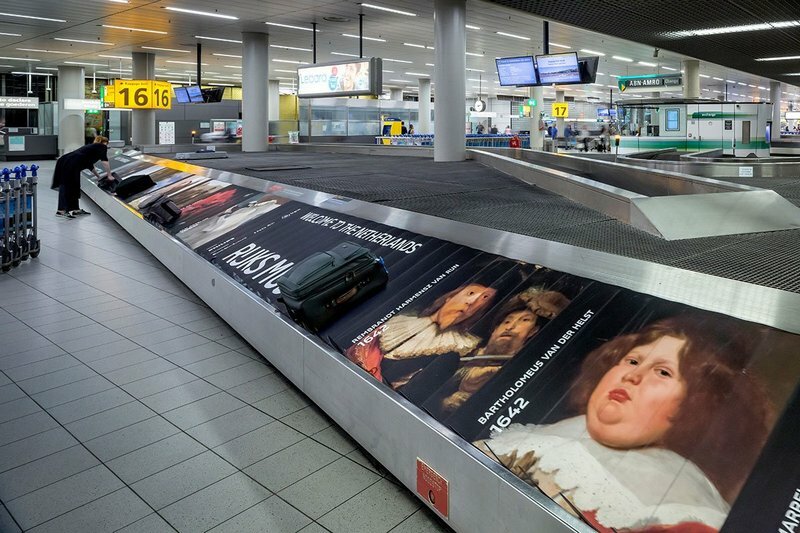 Enter Rembrandt, whose genius came to supervene on the painting. Not for him the static recording of his subjects on canvas. He animated his painting. He painted the group as if they were leaving on patrol. You can feel the life-size figures moving off as you look at them, you even feel you can at any moment depart on patrol with them, all you need do is step in. You clearly hear the captain’s command over the shuffling of their boots, the rattle of their armour, the beat of the drum and their Dutch prattle. You hear them arming their guns, and the smell of the gunpowder as they load their flintlocks strongly assaults you. You feel you are witnessing a period, a procession, not a snapshot in time. Rembrandt’s dramatic use of light and shadow brings a few characters into relief whilst subduing others. 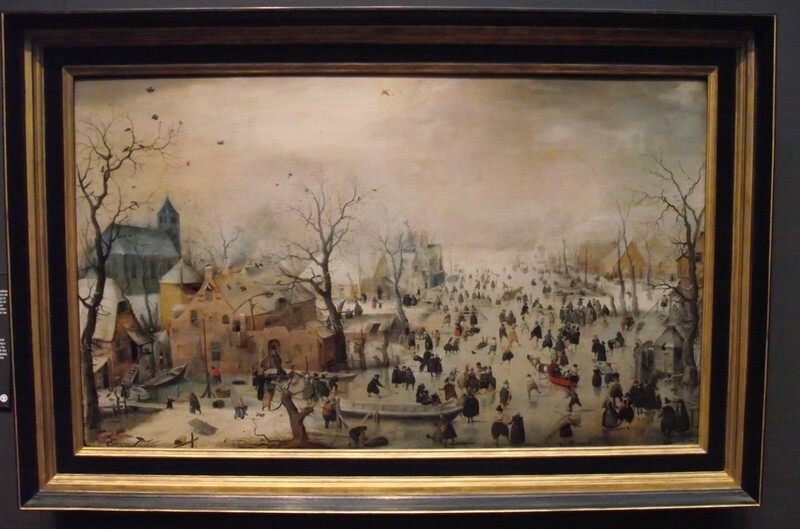 This tenebrism gives the painting a depth and dimension not found in the Van der Helst and other schuttersstukken. 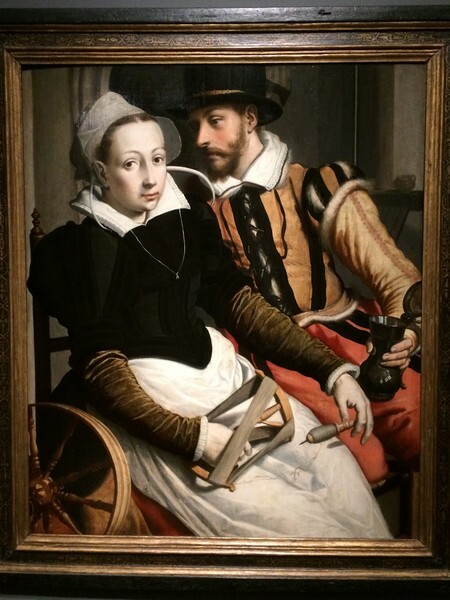 You see the characters as you would see them in real life, without the stilt of formal poses, and as such Rembrandt takes little care in tailoring them into the well-groomed finery that say a Frans Hals would. The composition is inspired. Elements other than militia men are present in the paintings; witness the barking dog, the running dwarf, the girl illuminated by a strange phosphorescent light, the faces of boys that peer at you from the feet of the men. It is even thought that Rembrandt smuggled himself into the painting as a partly obscured figure. 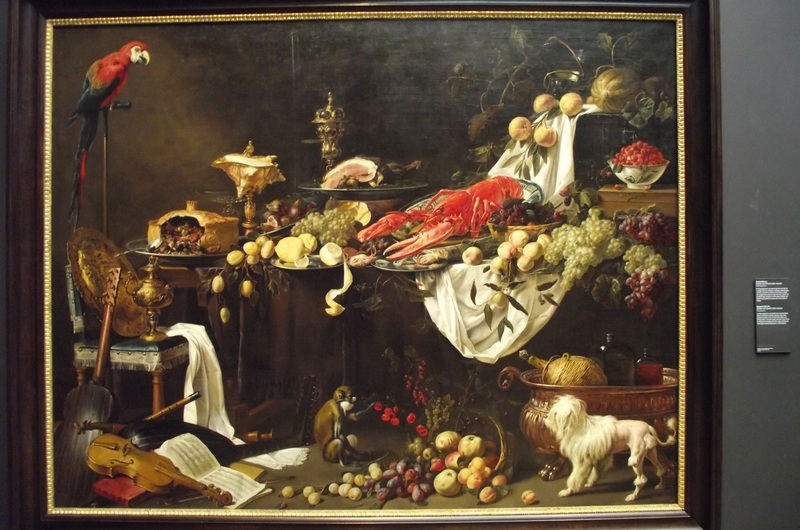 I cannot do the justice that knowledgeable art critics have done to the painting over the centuries, but content myself in knowing that there is much to fuss about. It is a marvel of a work, a truly magnificent painting. Nonetheless, the painting has stood the test of time and is indeed one of the great art treasures of the world.12 The re-opening of the Rijksmueum in April 2013 after years of refurbishment was celebrated with a flash mob depicting The Night Watch, and deservedly so.13 During my many visits to the painting that morning in the Rijksmueum, looking at it from different angles, and looking at the other paintings in the Honour Gallery, I was thankful that I had come to a point in my life where I could truly appreciate it. Like all great art, it’s a work that leaves one mesmerised. In my most fantastical dreams, I imagine myself as some sort of cultural ambassador for my city, with heft and clout. I imagine myself going around the art capitals of the world, persuading the curators of the great museums to send their most precious pieces for exhibition at the National Gallery in Cape Town for a few months. 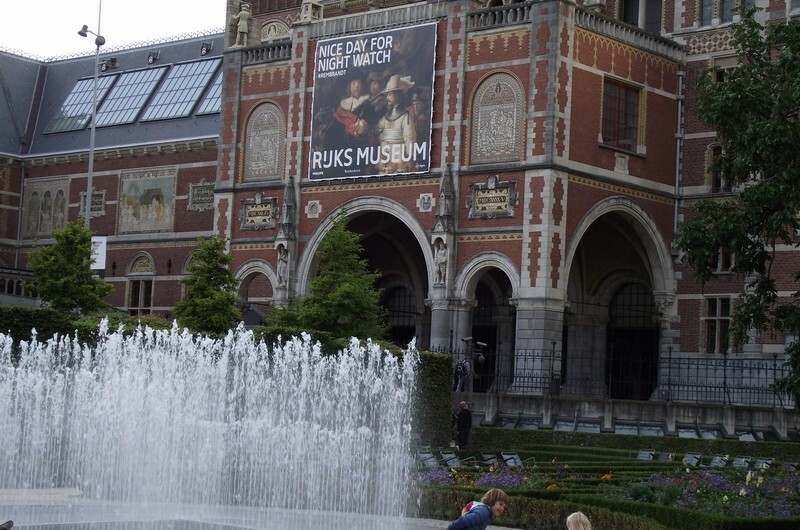 My first stop would be at the Rijksmuseum, where I would go straight to the office of the curator, who would of course, with much scorn and disbelief at my cheek, decline to part with The Night Watch for a second. I would then escalate the matter to the Dutch Minister of Culture, who would likewise give me the diplomatic shove, hastily calling in the Minister of Defence in case I didn’t get the message. And after they would have kicked me out, I would dust myself off, pick myself up and head to Italy to try my luck at securing a Caravaggio. Now that I think of it, what an education I was lucky to have! Do present-day school curricula afford exposure to the likes of The Night Watch at age ten? 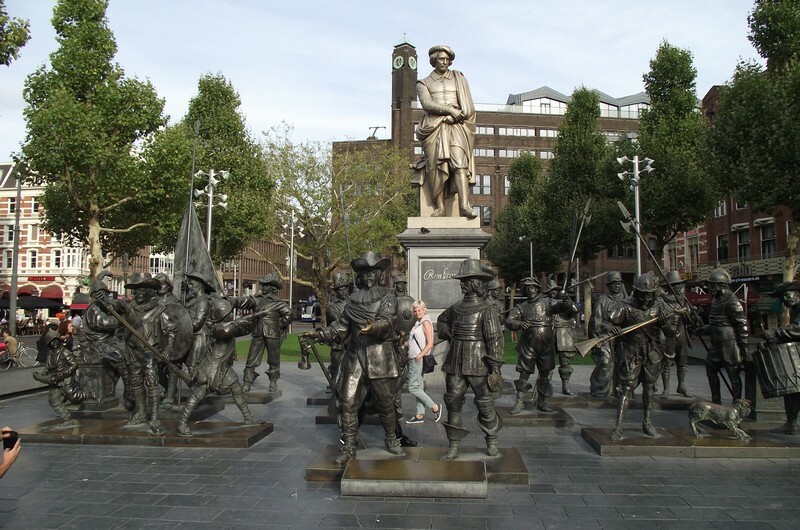 The sculptures replicating The Night Watch are by Russian artists Mikhail Dronov and Alexander Taratynov, and have been on permanent display in Rembrandt Square since 2012. Social status was largely determined by income in the Netherlands of the 17th century. Even though the Netherlands was a republic governed by a group of people called regenten, who were members of rich and influential families, it was the urban merchant class that de facto dominated Dutch society. The Dutch were expert traders, and Amsterdam became a wealthy city. Dutch dominance of global trade at the time came from a massive advantage they had in shipbuilding. “A fluyt is a Dutch type of sailing vessel originally designed by the shipwrights of Hoorn as a dedicated cargo vessel. Originating in the Dutch Republic in the 16th century, the vessel was designed to facilitate transoceanic delivery with the maximum of space and crew efficiency. Unlike rivals, it was not built for conversion in wartime to a warship, so it was cheaper to build and carried twice the cargo, and could be handled by a smaller crew. Construction by specialized shipyards using new tools made it half the cost of rival ships. These factors combined to sharply lower the cost of transportation for Dutch merchants, giving them a major competitive advantage. The fluyt was a significant factor in the 17th-century rise of the Dutch seaborne empire. In 1670 the Dutch merchant marine totalled 568,000 tons of shipping—about half the European total.” – Wikipedia. 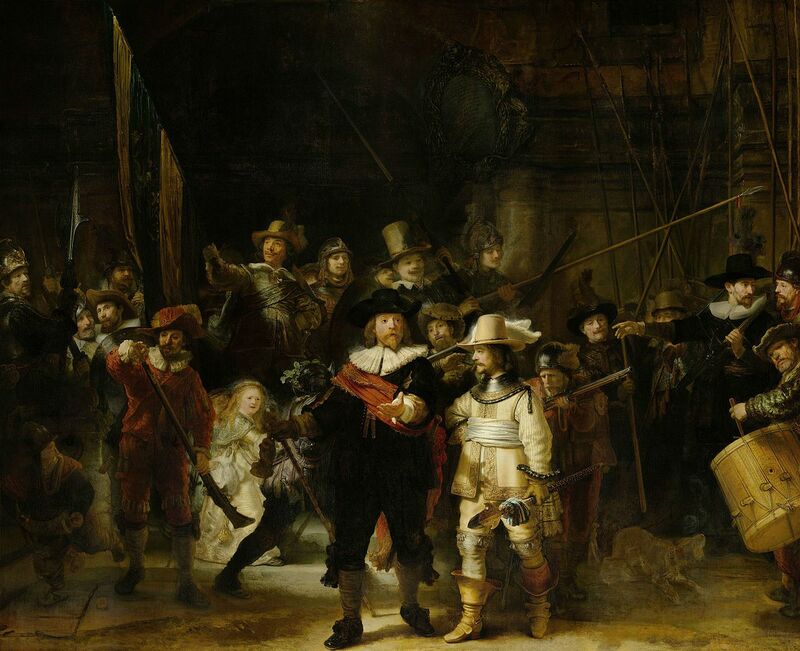 How much was Rembrandt paid for The Night Watch in today’s money? According to Willem van Osnabrugge in a piece called ‘Money in the 17th Century Netherlands’ at http://vanosnabrugge.org/docs/dutchmoney.htm:… “In the 1600’s Netherlands, an outdoor labourer earned 6.50 guilders per week or just over 300 guilders per year. A master carpenter earned 9 guilders per week or just over 450 guilders per year. Wages did not change for 150 years. A pastor earned 500 guilders per year. Today, economists find it difficult to express a meaningful correlation factor of cost of living between two very different cities e.g. Miami, Oklahoma and Miami, Florida, let alone find a factor for correlating cost of living between two countries over some 400 years. However, research on inflation and CPI over the period of 1600 to 2000, – as well as rate of exchange and purchasing power- gives us a workable factor of 60. That means that 100 guilders in the 1600’s equals US $6,000 in today’s (2016’s) money.’ So, at 1600 guilders, Rembrandt was paid roughly 96,000 in 2016 US dollars for The Night Watch, which you can round up to 100,000 in 2019 US dollars. 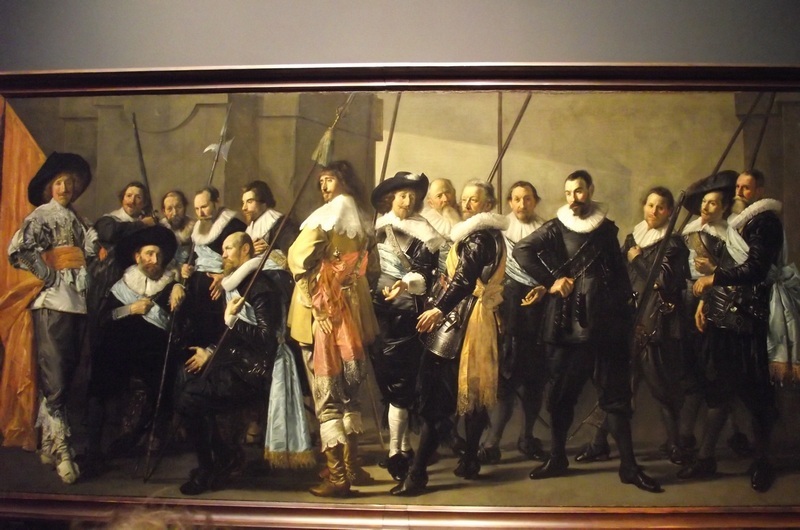 More specifically, they are ‘The Company of Captain Roelof Bicker and Lieutenant Jan Michielsz Blaeuw’ by Bartholomeus van der Helst, which hangs just to the right of The Night Watch in the Rijksmuseum, and to its left is ‘The Meagre Company, or The company of Captain Reinier Reael and Lieutenant Cornelis Michielsz Blaeuw’ by Frans Hals. Sources that I have read say that each sitter paid 100 guilders in the case of The Night Watch, which I somehow doubt. This may have been the case where each sitter got equal prominence in the standard schuttersstuk. But given that in The Night Watch more prominence is deliberately given to a few central figures, I very much doubt that this was the case. Or maybe every sitter did indeed pay one hundred guilders, which led to the discontent. Before the advent of the camera, you required the services of an artist to capture your likeness. 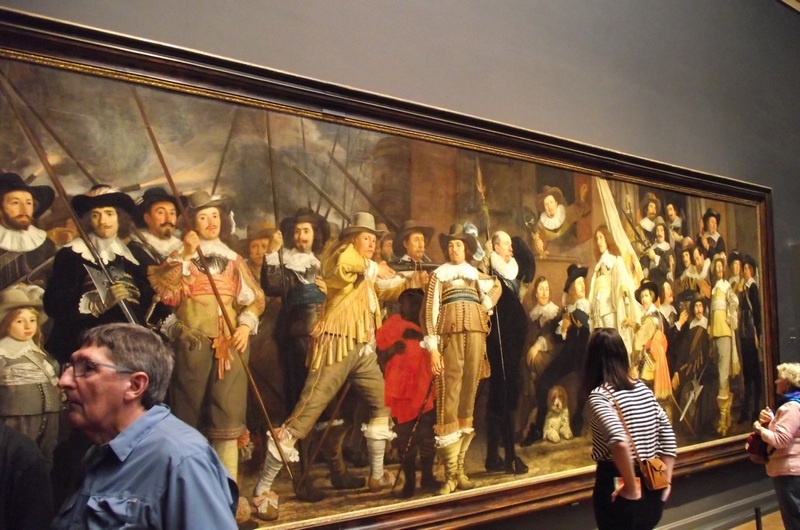 The Night Watch was painted in 1642, roughly 175 years before the first photographs were taken in the 1820’s. Today’s ubiquitous cameras on mobile phones were first introduced in Japan in the year 2000. Rembrandt went from being one of the wealthiest painters in Amsterdam to being declared bankrupt towards the end of his life. His possessions were taken from him by the court and he died in poverty. The Night Watch has a rich history as befits its status as an iconic art work. 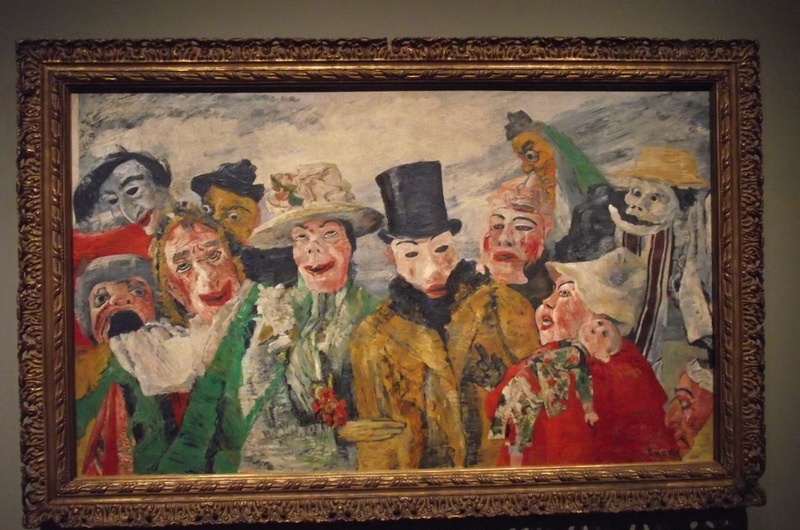 It was for example cropped to fit into a wall space in a building at one stage, and was hidden away in a bunker during World War II to hide it from Nazi looting. It was also vandalised and attacked a few times. 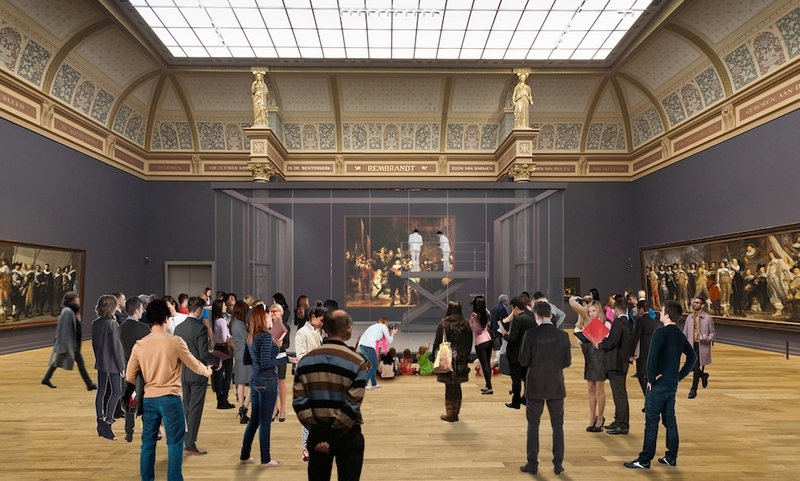 From July 2019, a new multi-year restoration of the painting will begin while it remains on public view.